We woke up Saturday morning still tired and wondering what the day would bring. JR went to the airport to see what we needed to do regarding our bags, and to collect our vouchers. We hoped we’d be able to stay in the hotel again that night since our flight wasn’t until 11 pm. It took him over two hours, and during that time he learned that although he and Abby had tickets that night, I didn’t, that our bags were most likely in DC or Frankfurt, and United would not give us a voucher for the hotel that day. However, they were generous enough to give us each another $7 food voucher! Instead of checking out at 11 am and spending the day in the airport we decided to go ahead and book the hotel room for another day anyway, and just pay for it ourselves. Luckily for us, there was a Chili’s restaurant just a two minute walk from our hotel. We love Chili’s (we have very sophisticated palettes). After we ate, JR took the baby back to eat while I hopped in a taxi and asked to go to the nearest grocery store so I could buy more diapers. The driver took me to Whole Foods, and I honestly wasn’t sure if they sold diapers there, but turns out they do! When I arrived back at the hotel we all took a long nap before making our way to the airport later that night. 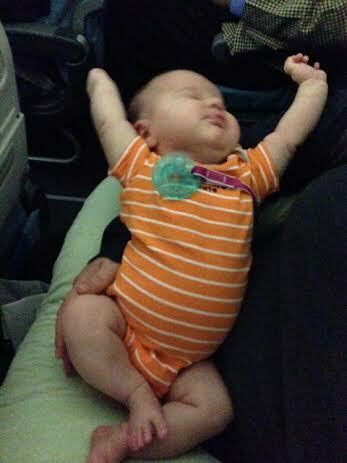 We wanted Abby to have a spot to stretch out during the long flight. Unfortunately, those rows were booked but they were able to put us all together, and that was the most important part. Our flight to Istanbul was pretty uneventful. Abby slept most of it and hardly ever cried. She didn’t seem stressed at all by our troubles up to that point. Abby really likes to stretch. We landed in Istanbul on time (shocker!) and walked down the steps to collect our stroller on the tarmac, which we had checked at the gate JUST before boarding the plane in DC, alongside several other strollers. We see all of these families putting their strollers together and strapping their kids in, but our stroller is no where to be found. I asked one of the employees if they were still unloading, and tried to explain that our stroller should be with this pile, but he didn’t really understand English. A nice lady attempted to translate for us and she gathered that our stroller was either in DC or lost, because it wasn’t on the plane. The employee kept on saying that if we gate-checked our stroller then it would be here. We obviously agreed with him, but that didn’t answer the question of where did it go? How in the world did they lose a large GATE CHECKED ITEM?! At this point I was like “WHY IS THIS HAPPENING TO MEEEEE”? JR made his way to a Turkish counter and asked about the stroller. They told him it could be in Pristina or DC, and we could wait and see when we got there, or he could exit through customs, find their Lost and Found, file a report, then come back through security and make the next flight. I told him I thought that was ridiculous and we’d deal with it at home, surely something would go our way and the stroller would be waiting for us in Pristina. The only highlight of this stop was running into our friends Shawn and Amy, returning from a weekend trip to Istanbul and on the same short flight to Pristina. It was nice to see some friendly faces and introduce them to Abby! Although we were scheduled to land in Pristina at 7:45pm, of course we were almost an hour late. 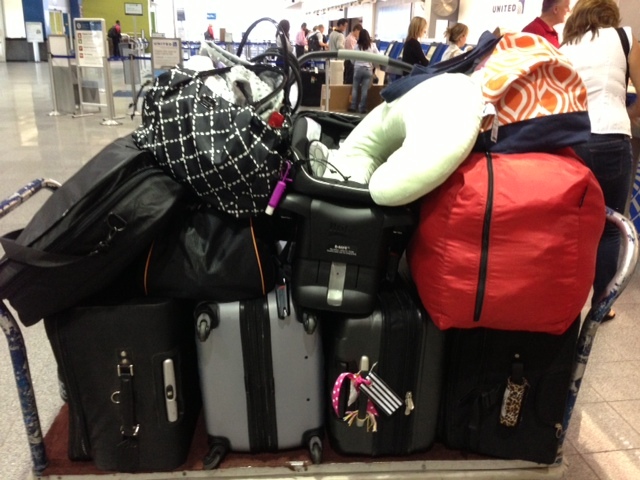 The good news was that ALL of our checked bags from our original flight were there waiting for us! The bad news was that our stroller was not. They told us to file a claim with Turkish when we got home. Sigh. Our friends were nice enough to wait for us and help us load up our bags in the van, and we were FINALLY headed home. Hooray! You know that feeling when you think nothing else could possibly go wrong? And then you realize you were so, so very wrong. In early April we sent two shipments – a layette with baby items like a Pack n Play, swing, etc., and a consumables shipment with food, diapers and wipes. The guys who handled that packout said that the crib, mattress, and rug should go in my consumables shipment to help with packaging and it allowed me more weight/space in my layette shipment (which has a limit of 250lbs – that adds up really quickly). We were under the impression BOTH shipments would be waiting in our apartment for us. Why would we assume this? Because they said that our shipments had arrived and were waiting for us in our apartment. Not so fast. Only the layette was there. Okay fine, at least we have her pack n play and swing, we can survive on that for a while. Then I realize our internet wasn’t working. Since we were away for so long, it appeared our contract with the internet company had expired. And then there was a small flood in our bathroom so there was standing water all over. So yeah, I had a major minor meltdown. Not my finest moment but I had definitely reached my limit. So that was Sunday and now it’s Friday. Maintenance fixed the leak first thing Monday which was great, although we then realized we had an ant problem as a result, but we’re getting that resolved too. JR had our internet fixed right away on Monday, and we’ve been in contact with the shipping company about the rest of our things. Consumables are currently in Antwerp, Belgium and should be delivered in about 2 weeks. And best of all, after many calls and emails with Turkish Airlines, we received our stroller yesterday! Things could have turned out much worse and we’re thankful that we received all our lost luggage, and that we all made it here safely and together. But – I’m going to need a lot of booze before I make a trek like that again. 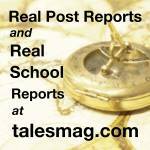 I considered a few different titles for this post, and almost named it “The time United tried to ruin my life.” But that seemed a tad dramatic. On Friday afternoon my mom dropped us off at the Cleveland airport. We took a few photos of our huge pile of luggage since we so proud of our packing skills and then we were off (or so we thought). We grabbed a bite to eat in the terminal before reaching our gate and because we were seated at a bar top up against a wall, I thought it was a good opportunity to let Abby stretch her legs. And then of course I took a picture because she is kind of passed out at a bar. For a hot minute I wanted to post on Facebook that Abby was passed out at the bar. Mom of the year right here. Since we had a tight connection in DC (only 55 minutes! ), JR asked the gate agent if they could have a United employee meet us in DC to help us make it to the next flight. We had 3 carry on bags, 2 diaper bags, the stroller, car seat, base, and the oh-so-critical Boppy, which made it difficult to move quickly. 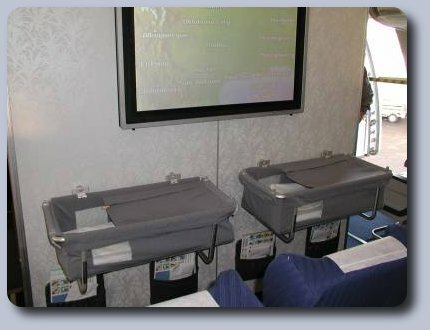 We also inquired about preboarding – we thought it would make more sense for us and for other passengers so we weren’t in their way as we tried to collapse and bag up our stroller right before getting on the plane, and while we installed our car seat and base in Abby’s seat on the plane. 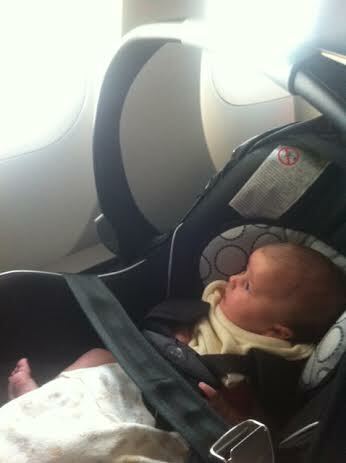 Getting the car seat in a car is hard enough, but we knew with the tight space on a plane it was going to be tricky. Apparently, United (and most other US carriers) no longer offer preboarding for families with small children. Who knew? The plane had some kind of issue so we were delayed leaving, and I kept glancing at my watch knowing we were losing valuable time to make our connection. 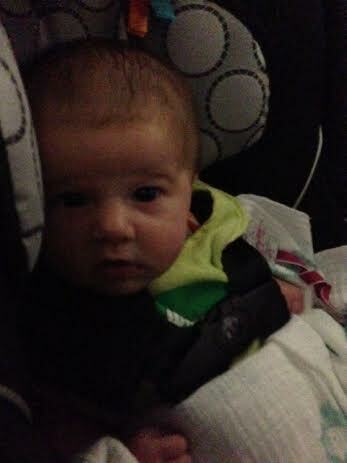 Abby was wide awake and staring out the window for most of the flight from Cleveland to DC. By the time we landed and made our way off the plane, it was 9:30pm. According to our tickets, boarding for our next flight began at 9:15 pm and closed at 9:45pm. I quickly asked the first few United employees that I saw if there was a luggage cart waiting for us, or even one of those oversized golf carts to drive us to Terminal C, which was a very long walk and a tram ride away. I showed them the printed slip from the gate agent in Cleveland that allegedly made the request prior to our arrival. Everyone I approached looked at me like they didn’t understand what I was talking about, and then told me “we don’t have carts here. We don’t do that here.” Oh. Okay then. When we explained a second time he looked at our tickets, at the clock, at ALL OF OUR CRAP, and told us we’d surely make our flight since it was a “2 minute walk.” Okay then. We rushed. We sweated. We cursed (at least I did.) We walked up to our gate about ten minutes past 10pm, and even though we knew the answer we still asked if we could board our flight. Nope. So we took our pile ‘o stuff and walked a few more gates down to a customer service area and got in line for rebooking. The guy there told us we may as well take a seat because it would probably take 30 minutes or longer. And so we sat. When he finally came over to us, he informed us that the earliest we could get out would be Sunday at 6pm on a Lufthansa flight. No guarantees we’d be seated together (all 3 tickets were purchased separately by JR’s work, so although it’s highly unlikely it would actually happen, technically Abby could have been seated by herself) and we would most likely not have the bassinet seat we’d been banking on for the long flight. He said United would cover our hotel and offer meal vouchers for the time we were stuck, but due to their policy, he could only offer us one night worth of vouchers. In the morning, we would need to check out of our hotel and return to Dulles to collect vouchers for the second night, because they also couldn’t guarantee the same room or even same hotel for us. I wish you could have seen our faces. But there wasn’t much we could do. We were very worried that our luggage made the connecting flight but he assured us that if we didn’t make the flight, then our bags wouldn’t be put on the plans. He then asked if we wanted our checked baggage with us, or sent ahead to our destination. Since we were looking at an extended delay we asked to pick up all of our bags. After he put in that request, he gave us instructions on where to claim the bags, where we might find an open place to eat (it was probably 11:15ish at that point) and how to get to the hotel shuttle. We made our way to baggage claim pretty slowly, because he said it would probably be an hour and a half before our bags were delivered. The deli he referenced had some pre-made cold sandwiches for $7.99 each. Note, our United food vouchers were for $7 per person. So I’m assuming they meant they would cover a few vending machine purchases, because you can’ t really have a meal for $7. JR was not pleased and we are still confused as to why they’re called “meal” vouchers. We purchased what we wanted, minus the $7 voucher from the cafe and settled in for awhile at baggage claim. JR paid for two luggage carts so we could transport our 5 checked bags to the shuttle, and we waited. It seemed like there were a lot of people around us having problems and the employees were coming by occasionally to provide information, but never to us. After an hour or so, I decided to wait in the line to talk to one of the United employees working in the baggage area. Very politely and apologetically, she said our bags were on their way to Frankfurt. I’ll never understand how they made the flight and we didn’t, but I digress. I asked her to check again, because just an hour earlier the man upstairs said he ordered our bags for us, and they’d be sent down here. No amount of double checking changed the answer, the bags weren’t coming. She did check to see if any new flight options had opened up, and due to a cancellation she offered us a chance to leave DC on Saturday at 5pm, fly to Munich, and then to Pristina. The catch was an 8+ hour layover in Munich. 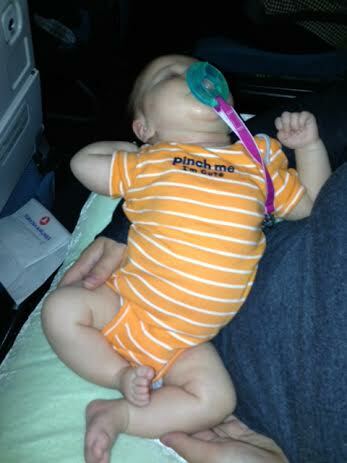 JR and I talked it over and thought that would be pretty miserable with the baby coming off an overseas flight. I felt confident if I could get on the phone with someone I could find us a better route, so we told her no thanks and made our way to the hotel shuttle. We left our empty luggage carts sitting there. The wait for the shuttle was probably only 20 minutes or so, but we were so burnt out at that point. 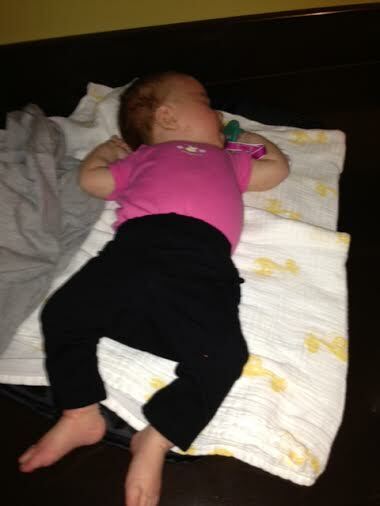 Abby had – amazingly – been asleep since we got off the plane. But she was finally starting to fuss, poor girl was hungry and needed changed. Of course we are outside and I don’t want to do anything to cause us to miss this shuttle and get to our hotel even later. I held her while JR changed her. Thank goodness it was only a wet diaper. We made it to the hotel around 1:30 am, got our room, fed the baby, and after a long phone call with United, I had us booked to leave Saturday at 11 pm. It had been such a long day and we all crashed for the night around 3 am. SPOILER ALERT – we eventually made it to Pristina safe and sound, but cranky.